Lion track found on the road. Cartridge for size comparison. 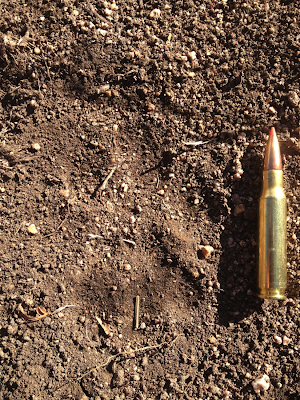 Most hunters do not readily know the exact length of the particular ammunition in their favorite hunting rifle. I am certain there are a few hand-loading sportsmen who have the formula for their prized hunting round burned into their psyche; however, I am not one of those few that take pride in manufacturing my own bullets. I instead sacrifice this part of the hunting experience for more scouting time by purchasing the store bought precision of Hornady Superformance ammunition. Yesterday I did not have even a small clue to the length of my rounds, however I do now. My partner for the day was an experienced lion caller who already had a confirmed lion call in. We departed the still sleeping city of Fort Collins at 5:30 in morning and headed for my favorite hunting grounds in the foothills. This hunt was the to be the culmination of many hours of research and even more countless hours of scouting and map review. Over the course of hunting lions last year I had identified several lion tracks and sightings in my area. I had dutifully marked all of the location of these tracks on my forest map. The lion tracks from the previous post, “needle in a haystack” were added to map last week as well and fell into place like a puzzle piece. The sightings and tracks told me a story. The tracks were arranged around a long, deep drainage that held a small river. Nearly all of the drainage is on public land but can only be accessed by foot during the winter months. Private land marks all of the terrain near the valley ridges preventing a hunter from entering from any angle other than the mouth of the valley. I had made a foray into this valley the previous hunting year and saw a copious amount of big game tracks and plenty of lion habit. I also knew from research that two lions had been killed by houndsmen in this same valley last season. Yesterday’s plan was to work our way up this valley stopping for call stands as we traveled. We entered the valley and set up a call stand nearly immediately. I was to call and he was to cover any approaches behind me and essentially be the eyes of the team to scout the surrounding rock piles and terrain. An hour of calling produced my usual raven and magpie companions, but no other animals. At times I worry that I am not calling correctly, my mind often stops at the fact that I routinely call in scavenger birds. I surmise that is proof enough that I sound like an animal in its last throws of life. After the stand my partner informed me he had seen two separate mule deer herds wandering the opposite hillside. This was heartwarming, for where they are, surely lions are not far away. We headed further into the valley and set up a second stand in the area beyond the sound travel limits from the first stand. It was my turn to be the cover and the eyes for the team. Approximately 45 minutes into the stand I caught movement on a rock pile about 500 yards further up the valley. Instantly my pulse quickened as I reached for my priceless Pentax binoculars. When I brought the rock pile into view I found a stately Rocky Mountain Big Horn Ram staring down the valley towards us. This ram was massive with 3/4 curl horns. Over the next 10 minutes the ram worked his way down the valley, pausing on the opposite hillside crossing our location around 300 yards away. The trip was worth this moment alone. To be so close to this wild majestic animal was truly a unique experience. After the ram moved along we ended the call stand and started up the valley once more. During our walk, we constantly scanned our surroundings and the old road we were following. My hope was to find a lion track in the interstate highway of deer and elk tracks the road had become. Our progress was halted when it came time to cross the river. The bridge that had once provided safe passage across the river was no more. Certainly the bridge was another one of the many victims of the torrential downpour that drowned the Colorado Mountains this previous September. We eventually were able to secure a crossing but this came in at the same time as the beginning of steady strong winds. Hand calling animals in strong wind is akin to attempting a conversation at a rock concert while standing next to a giant speaker. Simply put, it is a waste of time. After a snack and a discussion we decided to return to the truck and head into the high country in search of tracks in possible remaining snowfall. We began to walk back down the old road in the valley floor, and that is when we discovered it. 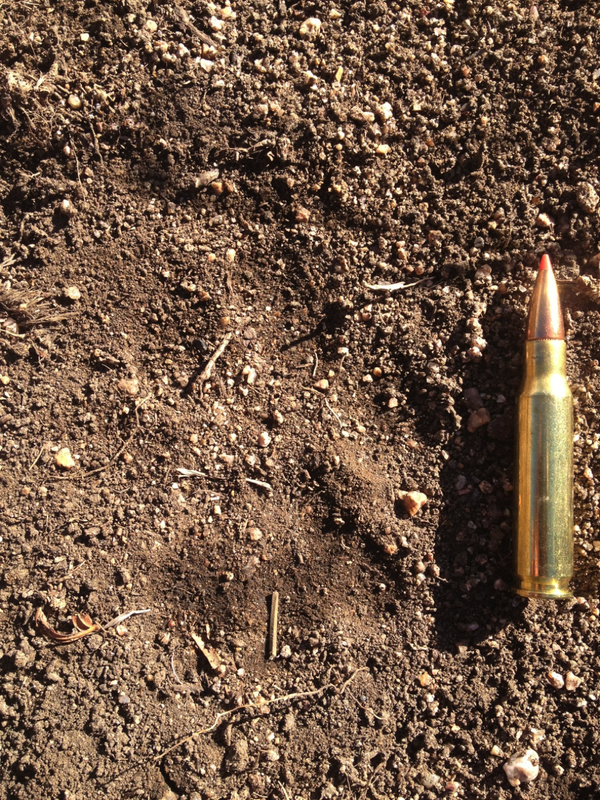 My 308 rifle cartridges are exactly 2 and ¾ inches in length, and that is the width of the lion track we found in the middle of the road. Somehow we had missed them on the approach to the downed bridge. It was very apparent the tracks were fresh, and they faced down the road and directly toward our previous call stand. We were able to follow the lion for about 50 feet before his tracks were lost in the grass on the side of the road. Another thirty minutes of fruitless searching turned up no further sign of his presence. We decided on one of two likely scenarios: The first is that we had called the lion in on the second call stand and missed his approach on the road, perhaps while enthralled by the Ram. Or the second scenario is that the lion had walked down the road earlier that morning and was now somewhere else in the valley. Either way, we were lost to the lion’s current location. We set up a third call stand, hoping the cat was still in the area. An hour produced nothing more than two chilled hunters with tired lungs. It was hopeless. The lion either could not hear us because of the howling wind, or was simply gone. I know that this may seem disappointing to some, but this is a huge success for me. Scouting, research, and interviews led me into this valley. I suspected there was at least one lion working the wildlife rich location, and I was correct. This day added to my feelings that I can really do this. With enough time patience, work, and a fair amount of determination I can figure out where and what the lions are doing. This was a great day and another milestone, several lessons were learned and good memories created with a new friend. Snow is coming to my mountains on Wednesday, any guesses on where I will be Thursday morning?